There is a “creepy person” contacting real estate agents via text messages. The phone number that has been appearing is: 513-609-1248, but it is a prepaid T-Mobile phone. Per law enforcement, not much can be done, however, if the agent responds, “Do not contact me anymore or I will contact the police“, then it could be considered a telephone harassment if continued and charges could be made if and when caught. One local brokerage has had eight (8) sales associates report that they have received the text, but most did not respond. Please see a screen shot of a sample text from this phone number below. Please emphasize safety in your offices, at meetings and with any interactions with your agents. Two female agents received similar texts Tuesday evening. 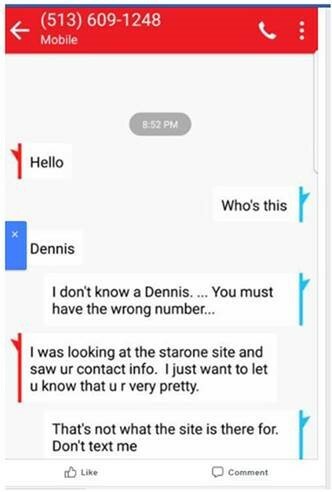 “Dennis” MAY be the guy’s name. At this moment, police are not 100% sure who this person is, but will keep investigating. From information gathered on a potential identity, there are no criminal records associated with this number or potential person. Since there were only compliments and in one case, an apology, there is really nothing that can be done via law enforcement. If you are contacted by this telephone number, 513-609-1248, please respond, “Do not make any more contact with me or I will contact the police.” Please do not give any information to him or her. Please continue to run your businesses with safety being the priority. Thank you and be safe! !